21.1 Many plants can be cloned from isolated single cells. Thus none of the original genetic material is lost during development. Steward concluded that each phloem cell contained the genetic potential for a whole plant; none of the original genetic material was lost during determination. The results of later studies demonstrated that most animal cells also retain a complete set of genetic information during development. In 1952, Robert Briggs and Thomas King removed the nuclei from unfertilized oocytes of the frog Rana pipiens. They then isolated nuclei from frog blastulas (an early embryonic stage) and injected these nuclei individually into the oocytes. The eggs were then pricked with a needle to stimulate them to divide. Although most were damaged in the process, a few eggs developed into complete tadpoles that eventually metamorphosed into frogs. In the late 1960s, John Gurdon used these methods to successfully clone a few frogs with nuclei isolated from intestinal cells of tadpoles. This accomplishment suggested that the differentiated intestinal cells carried the genetic information necessary to encode traits found in all other cells. However, Gurdon's successful clonings may have resulted from the presence of a few undifferentiated stem cells in the intestinal tissue, which were inadvertently used as the nuclei donors. 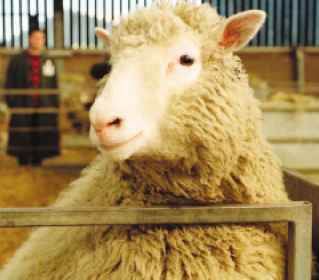 21.2 In 1996, researchers at the Roslin Institute of Scotland successfully cloned a sheep named Dolly. They used the genetic material from a differentiated cell of an adult animal. the cloning of Dolly, other sheep, mice, and calves have been cloned from differentiated adult cells. The ability to clone plants and animals from single specialized cells demonstrates that genes are not lost or permanently altered during development. One of the best-studied systems for the genetic control of pattern formation is the early embryonic development of Drosophila melanogaster. Geneticists have isolated a large number of mutations in fruit flies that influence all aspects of their development, and these mutations have been subjected to molecular analysis, providing much information about how genes control early development in Drosophila. The development of the fruit fly An adult fruit fly possesses three basic body parts: head, thorax, and abdomen (I Figure 21.3). The thorax consists of three segments: the first thoracic segment carries a pair of legs; the second thoracic segment carries a pair of legs and a pair of wings; and the third thoracic segment carries a pair of legs and the halteres (rudiments of the second pair of wings found in most other insects). 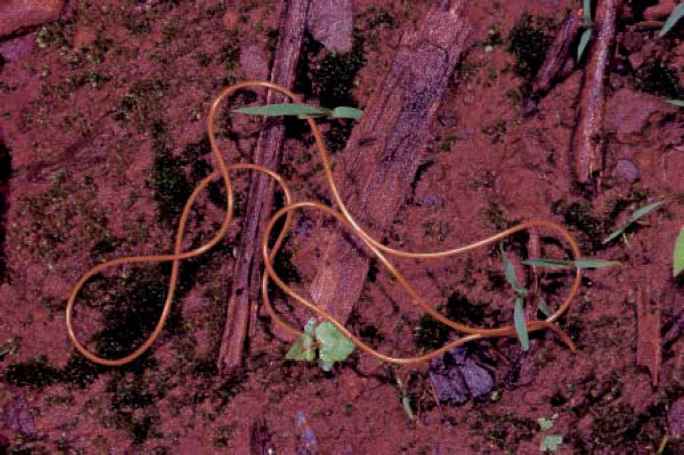 The abdomen contains nine segments. | Within a few hours, segmentation appears. ^ The embryo develops into a larva that passes through three stages. 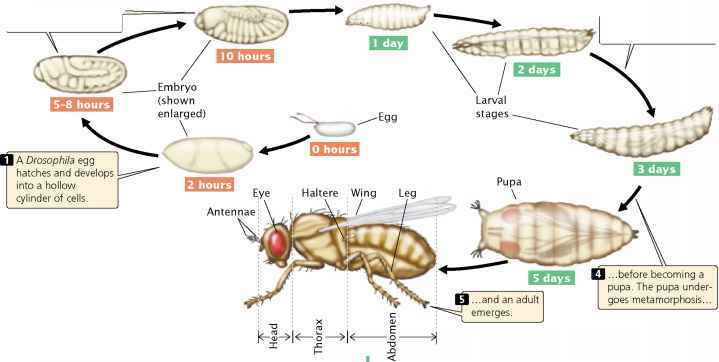 21.3 The fruit fly, Drosophila melanogaster, passes through three larval stages and a pupa before developing into an adult fly. The three major body parts of the adult are head, thorax, and abdomen. segment is established (I Figure 21.5c). Different sets of genes control each of these three stages (Table 21.1). Egg-polarity genes The egg-polarity genes play a crucial role in establishing the two main axes of development in fruit flies. You can think of these axes as the longitude and latitude of development: any location in the Drosophila embryo can be defined in relation to these two axes. There are two sets of egg-polarity genes: one set determines the anterior-posterior axis and the other determines the dorsal-ventral axis. These genes work by setting up concentration gradients of morphogens within the developing embryo. A morphogen is a protein whose concentration gradient affects the developmental fate of the surrounding region. The egg-polarity genes are transcribed into mRNAs during egg formation in the maternal parent, and these mRNAs become incorporated into the cytoplasm of the egg. After fertilization, the mRNAs are translated into proteins that play an important role in determining the anterior-posterior and dorsal-ventral axes of the embryo. Because the mRNAs of the polarity genes are produced by the female parent and influence the phenotype of their offspring, the traits encoded by them are examples of genetic maternal effects (see p. 000 in Chapter 4). Egg-polarity genes function by producing proteins that become asymmetrically distributed in the cytoplasm, giving the egg polarity, or direction. This asymmetrical distribution may take place in a couple of ways. The mRNA may be localized to particular regions of the egg cell, leading to an abundance of the protein in those regions when the mRNA is translated. Alternatively, the mRNA may be randomly distributed, but the protein that it encodes may become asymmetrically distributed, either by a transport system that delivers it to particular regions of the cell or by its removal from particular regions by selective degradation. Determination of the dorsal-ventral axis The dorsalventral axis defines the back (dorsum) and belly (ventrum) of a fly (see Figure 21.5). At least 12 different genes determine this axis, one of the most important being a gene called dorsal. The dorsal gene is transcribed and translated in the maternal ovary, and the resulting mRNA and protein are transferred to the egg during oogenesis. In a newly laid egg, mRNA and protein encoded by the dorsal gene are uniformly distributed throughout the cytoplasm but, after the nuclei migrate to the periphery of the embryo (see Figure 21.4c), Dorsal protein becomes redistributed. Along one side of the embryo, Dorsal protein remains in the cytoplasm; this side will become the dorsal surface. Along the other side, Dorsal protein is taken up into the nuclei; this side will become the ventral surface. At this point, there is a smooth gradient of increasing nuclear Dorsal concentration from the dorsal to the ventral side (I Figure 21.6). diploid zygote 0 sPerm and egg nuclei fuse to ---create a single-celled diploid zygote.